Gutters are the primary mechanism for moving water off a roof and away from foundation walls. 1-inch of rainwater washing off a 2,000 square foot home can account for as much as 1,200 gallons of water. Based on typical rainfall totals, that's enough to fill 2 swimming pools -- annually! The #1 cause of flooded basements and foundation damage is clogged gutters. 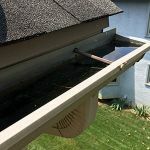 Excess water in gutters leads to wood rot, termite damage, and mosquito infestations. 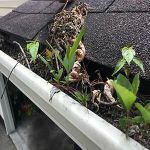 Ignoring clogged gutters can cause thousands of dollars of damage that is not covered by homeowner's insurance. 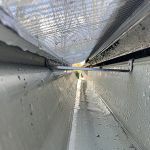 The simple way to avoid water damage is gutter cleaning on a regular basis or installing gutter guards that will permanently keep leaves and debris out of your gutters. We offer 3 gutter cleaning services. Reserve your gutter cleaning today! Or get gutter guards and we'll clean your gutters for free! *One level/Split level home with walkable roof. Additional fees apply for 2+ story, non-walkable roofs, landscaping & structural obstacles, etc. *One level/Split level home with walkable roof. Includes cleaning up to 1 compacted downspout. *1-level and 2-story home with walkable roof. Additional fees apply for 3+ story, non-walkable roofs, landscaping & structural obstacles, etc. Includes cleaning up to 2 compacted downspouts. *One or two level home with walkable roof. cleaning up to 2 compacted downspouts. Additional fees apply for 3+ story, non-walkable roofs, landscaping & structural obstacles, etc. Not sure what you need? Pick the service that is most appropriate and we’ll let you know when we’re cleaning your gutters if any additional work is required.